Question: How does this Solstice support the Heart? Summary of Interpretation: This Solstice supports the Heart’s mastery of old imprinting contained in the ego and new superpowers discovered through seeking, questing and regular spiritual practice. The Heart astutely holds the reins on what can be informative about the conditioning from the overculture, while reclining without resistance under the auspices of ancient wisdom. This puts the Heart in a place to move forward as if carried forth on a devoted, enlightened creature, and to be a fertile womb for seeds from cosmic sources. The overall aura generated would feel golden – rare and adding value to any situation. Choices in favor of leaping forward with courage and inspiration as if propelled from behind, and in favor of any material wealth that can be generated through the Heart’s gifts will be choices that allow the central mastery to show up in an Earthly way. In the Northern Hemisphere, a shift is happening such that more sunlight will fall on the region daily until the next Solstice. Therefore, setting intentions that would culminate in an expansion of Self during this solstice will create inner vessels for the incremental increases of daily energy. Intentions accompanied by daily prayerwork/practice call the Sun’s Qi into the vessels and then the Heart would have the fuel for expansion. The Moon will be full in Capricorn, opposite the Sun in Cancer. To read an explanation of this Full Moon’s attributes by Shamanic practitioner Lena Stevens and astrologer Patricia Liles, click here. June Solstice will be on June 21, 2017 at 12:24 AM Eastern Time (EDT). The Sun will enter the sign of Cancer at that time. To find the Solstice time in your zone, click here. Question: How does the June Solstice support the Heart? Summary of Interpretation: The Sun as the Great Giver in our solar system teams up with long-term companions Pluto and Mars to move us forward through transformation that has been ongoing, and into a free and strangely energized, Eagle-like state. With the Sun’s help, it becomes very timely to “step up” to shifts that have been masterfully orchestrated and to allow Solar explosions and blasting winds to fuel the motion. Explanation: In celebrating a Solstice, we honor the Sun’s shifting light pattern, and renew the Heart’s connection to it. The images in the Tarot spread serve as messengers from the Great Giver to the Heart. 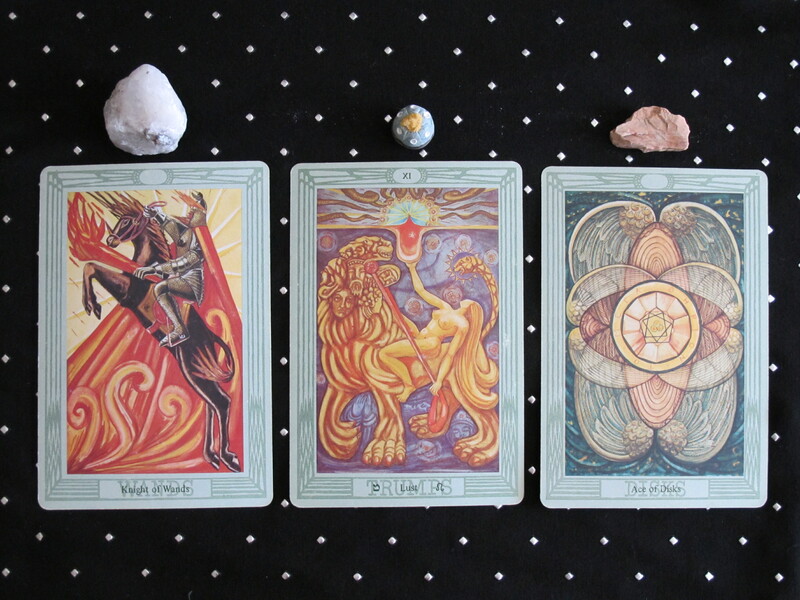 This spread additionally features a cooperative connection between Mars and Pluto, giving the Heart the experience of “rising from the ashes” and “stepping it up” on an emotional level and in the area of risk-taking. Atu XIII is the central card, with its Scorpionic images of death and rebirth (scorpion, snake, eagle, fish, skeleton). The skeleton is actually stirring up the bottom of the ocean, where decaying matter is going to bubble up to new life. This activity more closely resembles the activity of Pluto/Hades in the underworld than the Grim Reaper/Saturn announcing that time is up. The skeleton wears an eagle crown, for the way his consciousness takes flight. Utilizing the rotten fish and decaying matter is crucial to the experience of ascension, because the real-life decomposition that it represents was willfully chosen (the scorpion commits suicide in grave situations), with the eventual liberation in mind as the light at the end of the tunnel (eagle in flight). This Solstice period is supporting that dawn of light. Sometimes, Pluto, as one of the transpersonal, outer planets creates experiences for people that they only partially feel in a personal way. They may be shocked, stunned, surprised, or “spaced out,” but the majority of the processing of the experience happens beyond the ego’s radar. However, Mars as one of the personal planets collaborates with Pluto in Atu XIII, and brings the experiences to a level where they are felt closely. What previously putrefied in life was probably painful, but now there is a viscerally triumphant feeling of passionately moving on to new horizons. The cards to the left and right of the center contribute a few variations on the mobilizing ability of Mars. 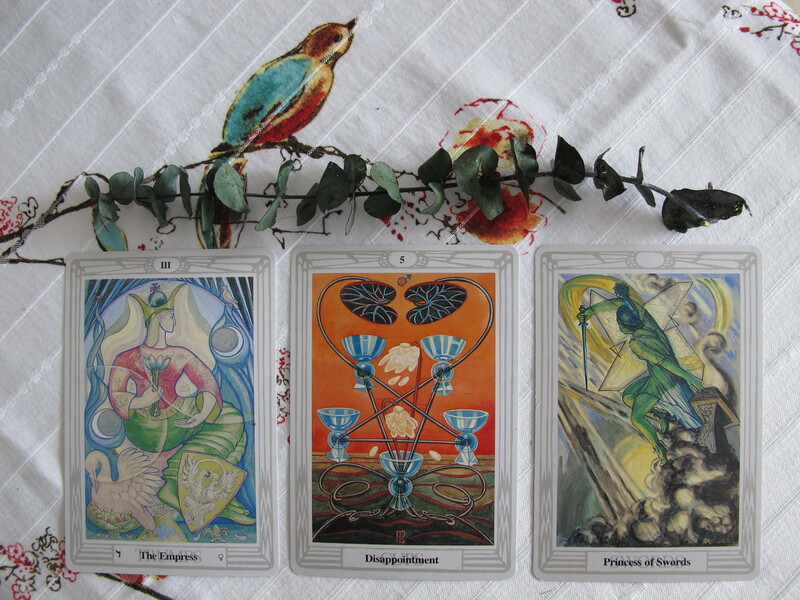 The 4 of Cups shows four very expensive golden cups being filled unequally. The red of Mars particularly colors the cups which are not being generously filled. This is a signal to appeal to Mars as an ally to move one’s focus from the splendor of the cups to the quality of the wine. In other words, allow the Sun and Mars to support the Heart in moving to a higher, more consistent level of joy. 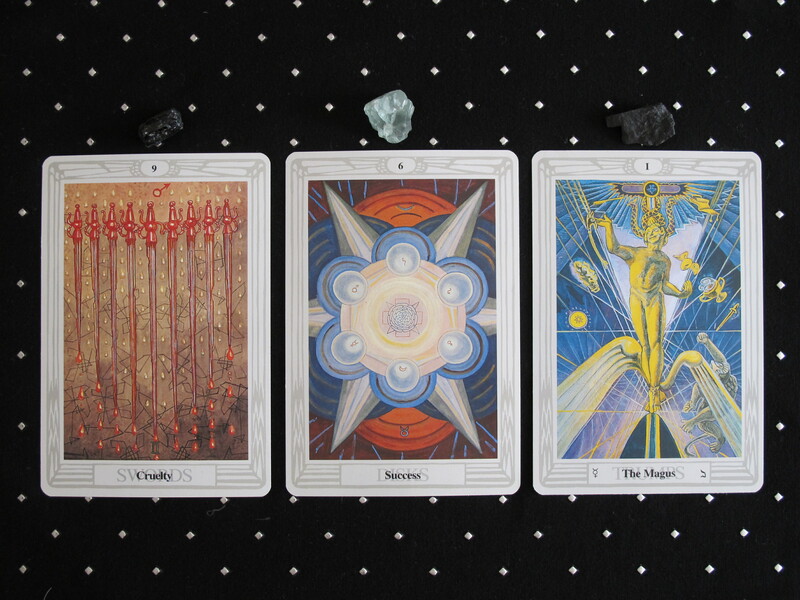 The Knight of Wands on the right similarly sports a lot of Mars-like swirling red together with swirling gold, attributed to the Sun. The Knight’s horse is rearing up as if to reach a higher level. His torch is ablaze with the potential to burn down obstacles. The Knight is also blown forward by an explosion. As a Solstice message to the Heart, this speaks of taking bigger risks, allowing the winds of change to carry one forward, and being more concerned with the learning gathered in the moments of truth than the concern to map out the whole journey all the way to the horizon. The new life bubbling up in Atu XIII can be created step by step, with the help of time and energy released from the past now available. A death and rebirth activity (Tibetan death ritual): Lie on your back, outdoors if possible. Ground into Mother Earth. Imagine the wind blowing away your skin, then flesh, then muscles, then arteries and tendons, then organs, then anything remaining besides the bones. Imagine an ancestor ally coming to rebuild you. Imagine the ancestor ally re-creating the physiological matter of your body, in the way that is perfectly structured to accomplish your new life. Every cell is programed to live the new life successfully. Imagine the ancestor ally endowing your new body with many gifts. 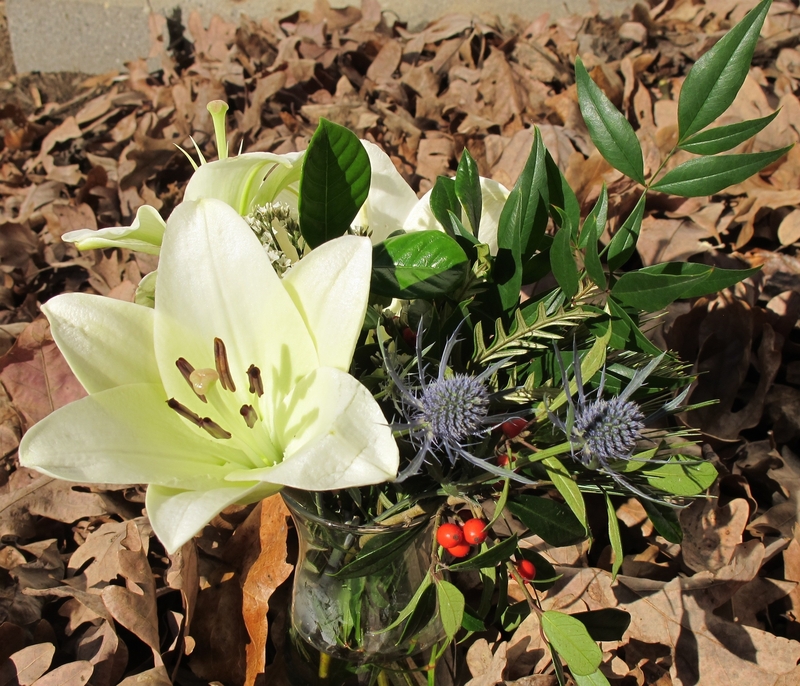 Thank the ancestor and give him/her a gift. Meditate and breathe a while to integrate the experience. Record images and dreams that occur to you over the next 1-2 days. 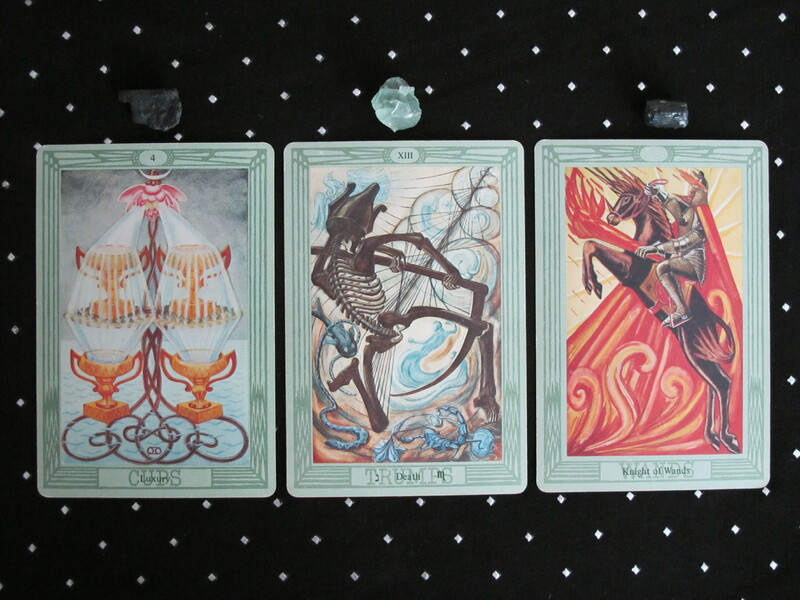 Meditate on the image of this Tarot spread throughout the Solstice period to solidify the intention to claim its gifts. The Micromoon will be full in Sagittarius, opposite the Sun in Gemini. The Super New Moon will be new in Gemini, together with the Sun. To find the time of the New Moon in your time zone, click here. 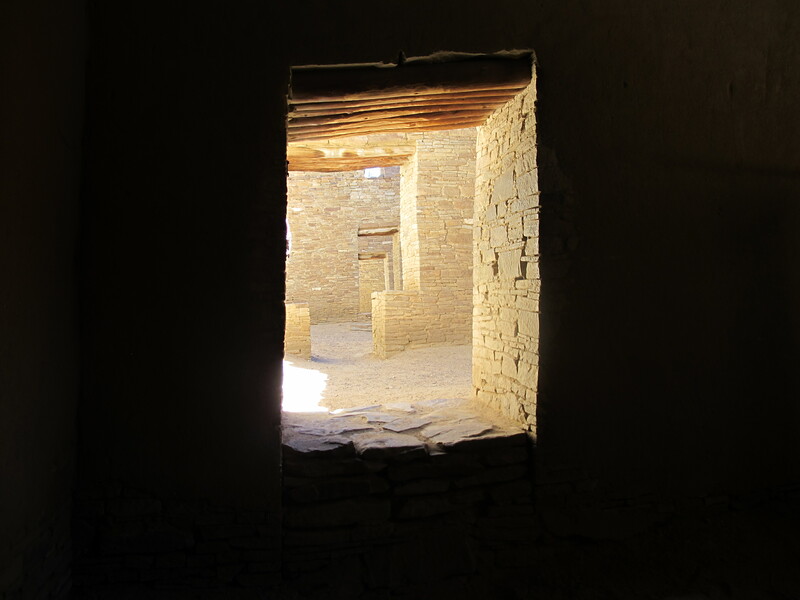 To read an explanation of this New Moon’s attributes by Shamanic practitioner Lena Stevens and astrologer Patricia Liles, click here. The Moon is full in Libra, opposite the Sun in Aries. Summary: This Full Moon as a crystalizing point of the lunar cycle from the last New Moon to the next, supports the Heart’s discovery of false hopes and impatient timeframes held by the ego, and the replacement of those with very stable feminine gifts, particularly 1) being a receptive channel for new life and 2) having the power to establish clarity and solidity amidst storms. Tidbit about Meditative work for Personal Transformation: A Tarot spread presents beautiful images rich with meaningful figures, colors, knowledge bases, astrological connections, and symbols. Meditating and reflecting on the spread during the portal period (the current lunar cycle), together with opening the Heart to welcome support from the Moon and one’s allies, supports the intention to accept the gifts that the Moon is offering through the communication tool of the spread. 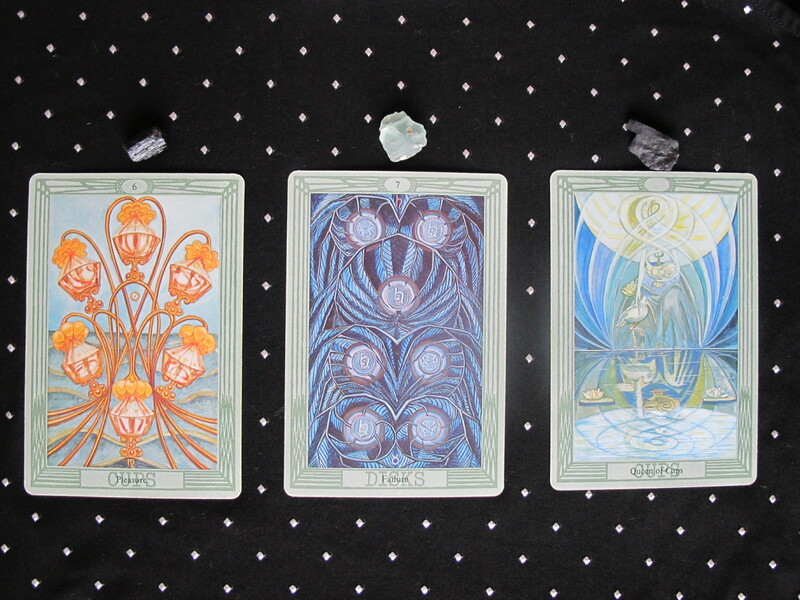 The Work and the Gifts: The central card indicates an emotional rut that is the pathway to discovery for this cycle. The way the cups are bone dry and the lotuses are falling apart as the result of the hot wind blowing from the red sky relates to the way the ego obsessively holds false expectations that tie up a lot of emotion, which includes pursuing some subconscious goals aggressively in the outer world instead of consciously setting sacred intentions, tending the fertile ground within to be a receptive magnet which attracts important opportunities, and connecting to the natural sources of power to align one’s own success with the greater good. The ego may have meant well, but it was not guided by the Heart’s wisdom. The card to the right further assists with the heartbreak (“egobreak”) of not getting what one wanted by encouraging the mind to attend to practical matters that are getting out of hand due to lack of shrewd and experienced attention. If “egobreak” is going on, energy is being scattered and important matters may be ignored, but the antidote is to pay attention, and involve the Heart’s wisdom to look at those matters from multi-dimensional perspectives. Looking away from the previous trigger of obsession to the other integral components of one’s life can provide a place for one’s true self to show up more clearly. Those experiences of clarity can inform the “egobreak” about how to regroup and come back with a deeper self awareness.